KARAPATAN strongly condemned the recent spate of human rights violations in Compostela Valley that happened in a span of days, with the killing of an eight-year old boy in the municipality of Mabini and the injuries on two other kids brought about by indiscriminate firing of soldiers, and the illegal arrest of two civilians in the municipality of Laak. 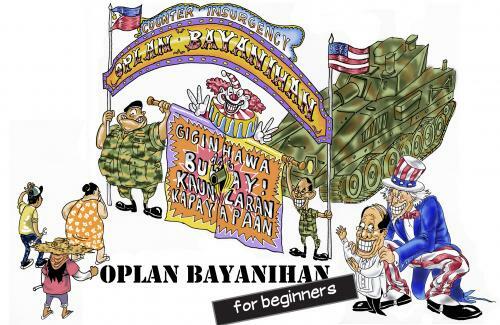 "Children and civilians are seen as fair targets for the military under Aquino’s counter-insurgency program Oplan Bayanihan," Cristina Palabay, secretary general of Karapatan said. The group, together with Bayan, Children’s Rehabilitation Center (CRC), and Bayan-Southern Tagalog held a protest action in front of Camp Aguinaldo at the headquarters of the Armed Forces of the Philippines (AFP). On April 3, in Brgy. Anipatan, Mabini, Compostela Valley, Roque H. Antivo, 8 years old, was killed by series of gun fires shot by elements of 71st Infantry Battalion of the Phil. Army headed by Lt. Col. Jerry Borja and certain "Llorca". Roque Antivo together with his two brothers, Earl Jhun, 12, Jeffrey Hernan, 13, were coming from the farm garden of their stepfather, Jeffrey Hernan where they harvested vegetables. "Mga bata mi sir!" (We are children, sir!) Earl Jhun shouted during the gun fire. Roque was hit above the armpit and the bullet exited on his left lung which caused his immediate death. Jeffrey sustained gunshot wounds in the chin and left shoulder while Earl Jhun was hit by splinters in the face. Roque Antivo, who is the 16th child victim of extrajudicial killing under the Aquino administration, will be buried today. The military claimed there was an encounter with the New People’s Army in the area, but the witnesses’ accounts clearly indicate that no such encounter occurred. On April 6, Army soldiers from the 60th Infantry Battalion abducted two civilians at around 9pm in Laak Municipality, also in Compostela Valley. The Philippine National Police (PNP) – Laak reportedly said that Arnel Rosales, 30 years old, a motorcycle driver and her passenger Ronylin Lucin, 20 years old, were presented to them by the military but later, the military brought the two victims with them. The police earlier denied the whereabouts of the victims, yet Rosales’ motorcycle was impounded at the PNP-Laak station. The two victims were brought to the prosecutor’s office in Nabunturan, where the quick reaction team of Karapatan-Southern Mindanao found them facing inquest proceedings based on charges of conspiracy to commit rebellion. They were later brought to the Compostela Valley Provincial Jail in Tagum City. 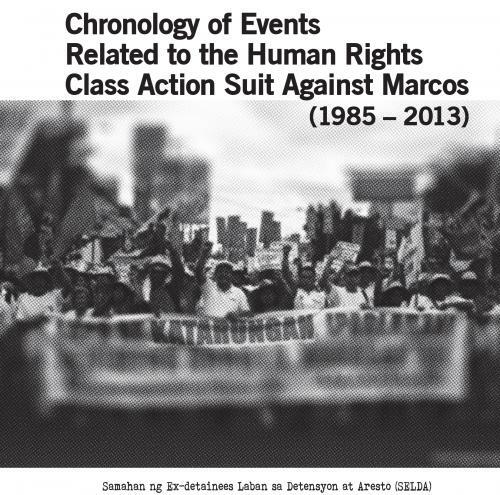 “It is hypocritical of the AFP to say that it wants closure on the abduction and enforced disappearance of Jonas Burgos, when the same forms of violations during the Arroyo regime – killings, abductions, illegal arrests based on trumped up charges, among others – are being perpetuated by Aquino’s AFP. How can there be closure when perpetrators of human rights violations are promoted to higher positions in the military and are not punished for their inhumane acts?” Palabay said.